Introduction: Scott Phillips is a genealogical historian and owner of Onward To Our Past® genealogy services. In this guest blog post, Scott shows that combining research in old newspapers with records from the U.S. Census is a good strategy, leading to genealogy discoveries about your ancestors you might otherwise have missed. All of us who love genealogy know we must check and double-check our data as we create or fill in our family trees. Our double-checking can be accomplished in any number of ways. One of the ways I really enjoy is discovering how complementary and helpful newspaper articles and obituaries from the databases of GenealogyBank are to each other. This is especially true when we take this a step further: when we compare and contrast newspaper articles with return information from the U.S. Census. When paired together, you will find that newspapers and the Census are great genealogy resource partners. Here’s an example of that complementary partnership. I was working on my maternal grandmother, Mae Anne Vicha, and tracing where she lived, etc. It wasn’t long before I came across information about her in an Ohio newspaper’s Society Pages. The column was titled “Social News of the Week” and featured as one of the tidbits the fact that the “B.C.B. 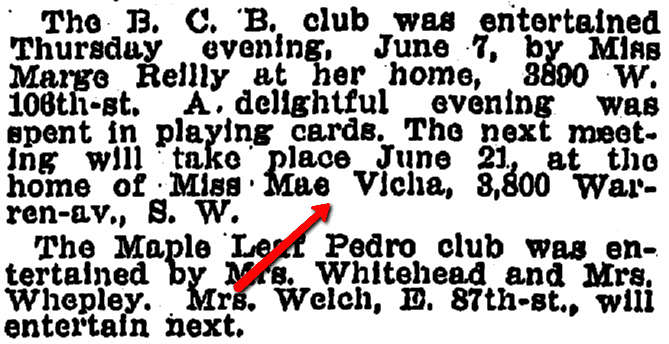 Club” (a literary and social club) would be entertained next, on June 21st, at the home of Miss Mae Vicha, 3800 Warren Ave. I then checked the United States Census for 1910 and sure enough, there was my grandmother, now married, but living with her Mother, brother and sisters all at 3800 Warren Ave.
Another interesting example I encountered of how newspaper articles and Census records can work together in tandem, leading you to great family history discoveries, occurred during some early genealogy research I was conducting on my Vicha ancestors. I was working through the Census returns on Teresa Vicha when I came upon the 1920 return. Not only did I find Teresa married to John Sluka, but I also found one of their daughters, Carolyn, living with them. Carolyn had married, taken the surname of Bidlingmaier, and had two children. Plus there was another treat: I found yet a second daughter, Teresa, also married and having taken the surname of Rehor. As I worked to corroborate this information about the Vicha family, the first item I found in the newspapers offered multiple benefits—just like the Census. This historical article is from an 1896 Ohio newspaper. While I was enjoying reading “In the athletic events the fat tailors’ race and the lean tailors’ race were the most amusing,” I found that John Sluka won one of the races (for the lean tailors, and he won a suit of clothes). Imagine my surprise when elsewhere in the same article it stated that my great grandfather, J. K. Vicha, was “the orator of the day” and was the national representative of the United Garment Workers and past president of the Central Labor Union of Cleveland. I knew from my earlier ancestry research that my first cousin (twice removed), Albert Sluka, had been a special policeman who was stabbed to death outside a dance hall. But his mother was Teresa, not Barbara as reported in this article! 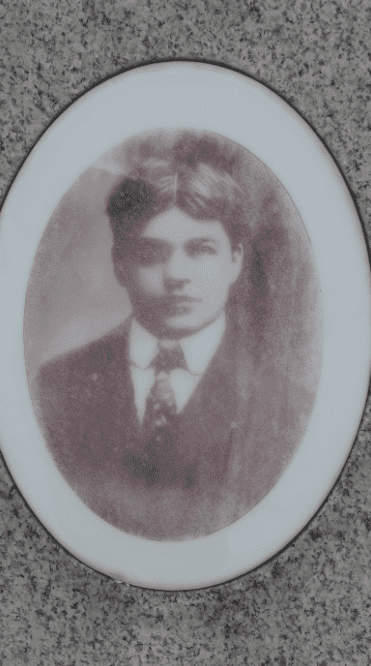 Photo: picture of Albert Sluka from his tombstone in Woodland Cemetery, Cleveland, Ohio. Credit: from the author’s collection. This was indeed an interesting, but perplexing, old news article that required some additional and very enjoyable genealogy detective work. I’m glad to say I was able to straighten out the story. Barbara was actually the grandmother, not the mother, of Albert. Plus she did recover from her attempted suicide and lived for an additional 12 years. Perhaps it was Barbara’s thick Bohemian accent combined with her advanced age that caused the newspaper reporter to get the details just a bit mixed up. Do you work with Census records and newspapers in tandem? If so, what have you found that has helped you the most in using these resources to research your genealogy? Very interesting research story. I enjoyed the read! Thanks for the kind words, Missy! I hope you continue to enjoy all the articles here on the GenealogyBank.com blog!